The mission of the Master of Arts in Educational Mathematics program, in alignment with those of its university, school and department, is to provide mathematics teachers with experiences that will strengthen their pedagogical content knowledge, empowering them to (a) increase instructional effectiveness, (b) influence the ethos of learning mathematics, and (c) become teacher leaders in mathematics. To increase teachers’ mathematical skills and understanding, including the ability to solve problems and to reason mathematically. To develop teachers’ awareness of historical and contemporary mathematics. To improve teachers’ ability to represent and communicate mathematical ideas. To meet these objectives, the Master of Arts in Educational Mathematics requires coursework in three areas: Mathematical Processes, Mathematics from a Modern Viewpoint, and Comparative Studies in Mathematics. These are described under Goals and Objectives below. In addition to graduate courses, candidates must complete Comprehensive Exams related to content and pedagogy and must conduct an Action Research Project regarding their classroom practice. The following program goals were developed in concert with a needs assessment of local, practicing mathematics teachers and state/national/international recommendations for mathematics education. These goals are operationalized in the components of the degree program. Courses in the Mathematics from a Modern Viewpoint component emphasize intensive explorations of core curricular topics. With a deeper understanding of mathematics, teachers are better able to make the discipline meaningful for their students. Having a connected, comprehensive, and detailed view of mathematics enables teachers to make instructional decisions based, not simply on good practice, but according to fundamental principles that guide all of mathematics. Courses in the Comparative Studies in Mathematics component emphasize historical, cultural, and contemporary issues related to mathematics and mathematics education. Taking courses in mathematics beyond the traditional core of algebra/geometry/calculus encourages fresh insights into thinking and reasoning mathematically. Looking at mathematics through a variety of social and applied lenses provides teachers an opportunity to strengthen both inter- and intra-disciplinary understandings, ideas that can influence personal and professional definitions of what it means to do mathematics. Students must design, implement and reflect on an action research project in a mathematics classroom setting. By definition, action research is designed to produce (a) an awareness of the impact of teaching decisions and (b) how to improve one’s teaching practice. Additional details are given below. A comprehensive three-hour written examination will be required for program completion. The exam will include questions from each of the three program components (Mathematical Processes, Mathematics from a Modern Viewpoint, and Comparative Studies in Mathematics). The examination is administered upon completion of course requirements from the three areas. Additional details are given below. Admission to graduate programs at Otterbein University is open to graduates of regionally accredited colleges or universities, who hold a four-year degree, and have the intellectual, academic and personal ability to succeed in graduate studies. Individual programs establish their own requirements (including but not limited to recommendations, standardized entrance test scores, interviews, and writing samples) that are approved by the University Graduate Committee and administered through The Graduate School office. Admission to the Master of Arts in Educational Mathematics is open to graduates from a regionally accredited college or university who hold a four-year degree in Mathematics or a closely-related field and have a minimum undergraduate cumulative grade point average of 3.0 on a scale of 0-4. Applicants are required to submit a completed application, official transcripts for all previous college and/or university work, two recommendations, a current resume, and a personal statement that addresses how the applicant’s goals and interest in the MAEM program are consistent with the purpose and goals of the program. Applications will be accepted for the Fall Semester, Spring Semester or Summer Term, and should be received four weeks prior to the desired admission term. Please contact the Graduate School at 614-823-3210 for specific dates. A maximum of six semester hours of graduate work with a grade of B or higher may be transferred from an accredited graduate program upon approval of the Graduate Program Director. After a student has been admitted to the graduate program, continuous progress toward completion of the degree is expected. The time limit for the completion of graduate course work is five years, computed from the first date credit is recorded on the college transcript until the program curriculum requirements are completed. Any transfer courses taken outside of the time limit will not be counted toward the degree. No transfer credit is awarded for life experience, portfolio, or credit by examination. The time limit for the completion of MAEM course work is five years, computed from the first date credit is recorded on the college transcript until the program curriculum requirements are completed. If this cannot be met due to circumstances beyond the student’s control, an extension request can be submitted to the Graduate Program Director for consideration. Every graduate student is assigned an academic advisor who is a full-time faculty member. Students are encouraged to contact their advisor with questions, concerns and related academic issues. A plan of study is developed between the advisor and the student and reviewed at least annually. MAEM graduate students will have an academic advisor in the Department of Mathematical Sciences to help determine their course of study and a faculty project mentor who has similar interests for their research projects. To promote a culture of sharing “what works” among teaching professionals (colleagues of MAEM candidates). The research project will normally be conducted in the candidate’s classroom. 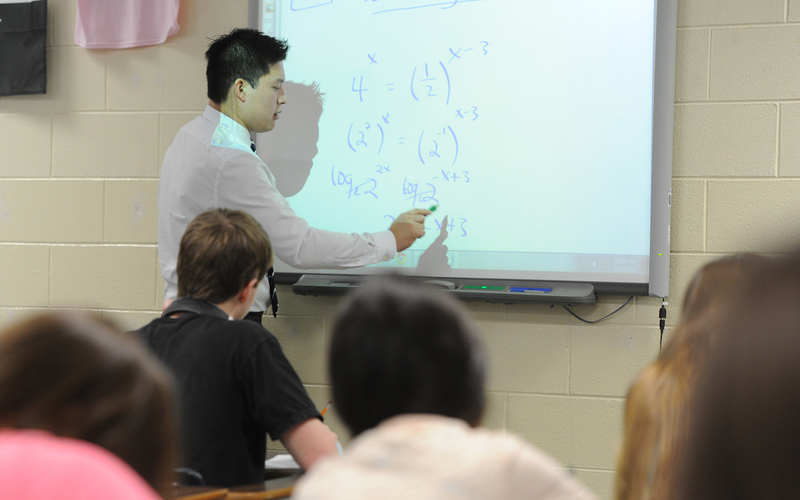 If candidates are not currently teaching in a mathematics classroom (grades 7-12), a field placement will be secured following the Otterbein’s Special Projects Field Placement Protocol. and a brief description of the student’s responsibilities and host teacher’s expectations for the placement. To accommodate special projects, the Coordinator of Field Placements requires submission of this information at least six weeks prior to the start of the field experience. Once this information has been provided, the Coordinator of Field Placements will contact school district officials to begin the placement process. Additionally, students must have current background checks on file in the Education Department prior to the start of any field work. A comprehensive three-hour written examination will be required for program completion. The exam will include questions from each of the three program components (Mathematical Processes, Mathematics from a Modern Viewpoint, and Comparative Studies in Mathematics). Questions from each component area will be provided by instructors who teach that component. Instructors providing the questions will also be responsible for evaluating student responses. The examination is administered upon completion of course requirements from the three areas. Students are expected to achieve at least 80% proficiency on the exam. A student who does not achieve this level will be encouraged to arrange an independent study with an appropriate instructor to address areas of concern. The student must then repeat the exam. Clusters of courses in the MAEM program can be taken in fulfillment of Certificates of Specialization. Certificates of Specialization can be awarded prior to and without completion of the MAEM program. These certificates are awarded by Otterbein University in recognition of expertise in Applied Mathematics, Foundational Mathematics, or Metrics and Visualization. More than one certificate can be awarded to an individual.